05/12/2003 - Determination of airborne concentrations of methylene chloride; protection of employees covered by 1910.1052. Title: 05/12/2003 - Determination of airborne concentrations of methylene chloride; protection of employees covered by 1910.1052. Thank you for your February 21 letter to the Occupational Safety and Health Administration's (OSHA's) Directorate of Enforcement Programs. You have questions about an aerosol subject restraint (ASR) spray containing methylene chloride, identified as [product identity removed], that is manufactured by [manufacturer's name removed]. This letter constitutes OSHA's interpretation only of the requirements discussed and may not be applicable to any question not delineated within your original correspondence. Our replies to your paraphrased questions and scenarios are provided below. Scenario 1: Florida Highway Patrol sprays its employees with [manufacturer's name removed] methylene chloride-containing ASR ([product identity removed]) in training, prior to being issued this product for use during law enforcement activities. Question 1: Is the Florida Highway Patrol covered by the OSHA Hazard Communication Standard, 29 CFR 1910.1200, due to this practice? Reply: No, because the Occupational Safety and Health Act of 1970 (the Act), which established OSHA, excludes states and political subdivisions of states from coverage, except in states which administer federally-approved state plans. Twenty-six states and territories currently administer such plans, but Florida is not among them. Since Florida Highway Patrol employees are employees of the State of Florida, they are not covered by OSHA requirements, including those in the Hazard Communication Standard. Question 2: Does OSHA identify methylene chloride as a potential occupational carcinogen? Reply: Yes. Please refer to the introduction for OSHA's methylene chloride standard, 29 CFR 1910.1052. Question 3: s the amount of methylene chloride cited in the [manufacturer's name removed] correspondence consistent with permissible exposure levels set by OSHA? Reply: Please be aware that the air concentration levels of methylene chloride provided by [manufacturer's name removed] are not indicative of the actual airborne exposure to methylene chloride that an individual sprayed with [product identity removed] experiences. [manufacturer's name removed] provided you with the uniform air concentration values of methylene chloride that would be produced if [product identity removed] were sprayed into an 800 cubic foot, unventilated, air-tight room. That is, 3.25 parts per million (ppm) for a 1-second burst of spray, 9.75 ppm for a 3-second burst of spray, and 97.5 ppm for a 30-second burst of spray, are the concentrations of methylene chloride that would exist at every point in the room after the spray has completely diffused. Air sampling could help to establish whether either the immediately dangerous to life or health (IDLH) level for methylene chloride of 5,000 ppm or OSHA's 15-minute short term exposure limit of 125 ppm is exceeded. Also, if there is any doubt as to whether OSHA's 8-hour, time-weighted average exposure limit for methylene chloride (25 ppm) is exceeded, then this exposure should also be determined by conducting personal air sampling. Question 4: Does our application of this product require compliance with any OSHA rules cited in the "Technology Bulletin"? If so, can you provide specific steps required to be taken? Reply: No. The Florida Highway Patrol is not required to comply with any OSHA rules because, as we stated in our reply to Question 1, it is not a covered employer under the Act. However, employers covered by either Federal OSHA or a State plan must comply with the methylene chloride and hazard communication standards when using this product. ensure that the ASR spray cans are labeled, tagged, or marked to relate that they contain methylene chloride and that methylene chloride is a carcinogen. Note: The methylene chloride standard contains within it references to portions of the hazard communication standard that apply to methylene chloride. Moreover, 29 CFR 1910.1052(k) specifies the hazards associated with methylene chloride that must be communicated on labels and in material safety data sheets (MSDSs) in accordance with the requirements of the hazard communication standard. Please refer to the methylene chloride and hazard communication standards for more details on their requirements. Thank you for your interest in occupational safety and health. We hope you find this information helpful. 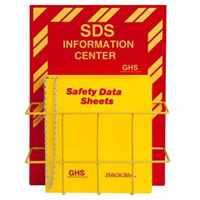 OSHA requirements are set by statute, standards, and regulations. Our interpretation letters explain these requirements and how they apply to particular circumstances, but they cannot create additional employer obligations. This letter constitutes OSHA's interpretation of the requirements discussed. Note that our enforcement guidance may be affected by changes to OSHA rules. Also, from time to time we update our guidance in response to new information. To keep apprised of such developments, you can consult OSHA's website at http://www.osha.gov. If you have any further questions, please feel free to contact the Office of Health Enforcement at 202-693-2190. 1 OSHA defines the breathing zone as an 18" diameter sphere around the employee's head.